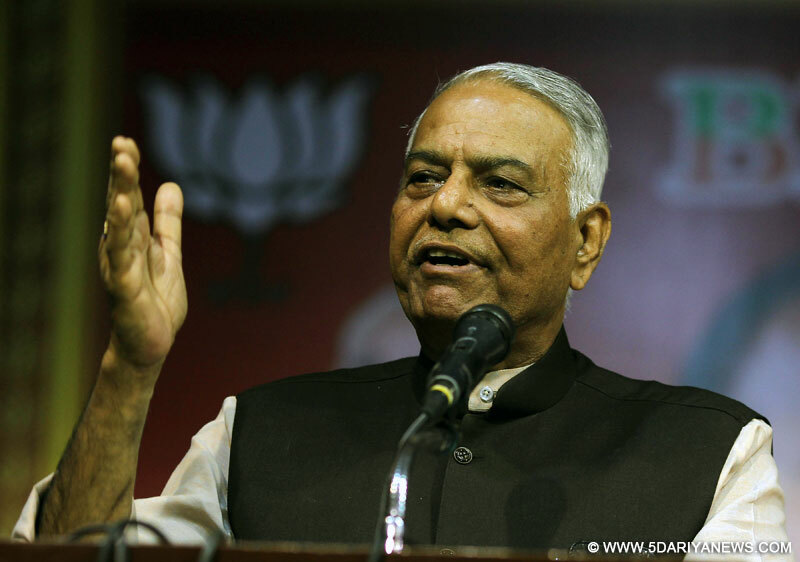 Former Union Finance Minister and BJP veteran Yashwant Sinha on Tuesday termed demonetisation and the Goods and Services Tax (GST) as "failures" and said the country can demand Finance Minister Arun Jaitley's resignation for the two moves that has led to a "slowed down economy".Though the BJP veteran refrained from making any political comments, he claimed that it was of utmost importance to speak about the "worrying" economic situation of the country.Sinha, who is on a three-day visit to poll-bound Gujarat, was talking about the effects of demonetisation and GST on the Indian economy at a press conference organized by Lokshahi Bachao Andolan, a group formed in Gujarat. He said, "The people of India can demand the Finance Minister's job for a slowed down economy and failures of the demonetisation and GST. ""The present government received some problems from the previous government, which badly needed to be addressed. Those were the non performing assets (NPA) of the banking sector and the stalled projects of over Rs 2-25 lakh crore in the country," he said. "During the three and a half years, the stalled projects have decreased a little bit, but projects worth Rs 17-18 lakh crore are still stalled. Old projects have not moved forward and no new projects have been taken up. The NPAs of around Rs 8 lakh crore still remain to be addressed. Due to this the growth rate has fallen. During the last quarter of the UPA government the growth rate was 4.7 per cent, which according to the current modified calculations is 6.5 per cent. The present growth rate is 5.7 per cent, which actually when calculated as per the old method is 3.5 per cent," Sinha said. He said, "Instead of providing 2 crore jobs annually as promised by the government, 20 lakh people became jobless due to the ill effects of demonetisation. It not only increased the problems of people economically but also socially. The very aim of demonetisation of removing black money, as the Prime Minister repeatedly uttered during his November 8 night speech, was never fulfilled. Then the goal post was changed every other day but none of them were achieved. ""The GST too is a very good scheme, but the way it has been implemented by the present government is a sheer failure. The Gujarat Finance Minister during the meetings of the GST during the UPA government had vehemently opposed it, while the present NDA government while launching it termed GST as the biggest reform the country has ever seen. The economy after the ill-effects of demonetisation received another blow through the GST. Due to that despite being a good initiative it has been given a bad name. "To improve the present economic situation, Sinha suggested some measures. "A fundamental improvement in the GST is badly needed. And there should be an immediate break on the ad-hoc stance the government is taking on it every other day. A 4-5 member committee should be formed under the chairmanship of Vijay Kelkar, a former Secretary and a former chairman of the 13th Finance Commission and who recommended in 2003 that GST should be implemented in the country. ""The Cabinet and the Finance Ministry should periodically consult this committee and within a couple of months the economy can drastically improve before the time the government presents its next budget." To a question on India improving its ranking in the ease of doing business index, Sinha said it was a thing for Indians to be proud of. "The problem is that whenever the world praises us we accept it but the moment we are criticized we disown it. It is more important that we worry about what India thinks of us than what the world thinks,"said Sinha.To a question on Finance Minister Arun Jaitley terming Rahul Gandhi's demand of GST in one single slab as "childish", Sinha said: "Jaitley himself had at some point in history said that GST needed a single tax rate. But now that the opposition is asking for it, he suddenly finds it childish. "Sinha said one big weakness of the present GST was that only about 60 per cent of the revenue stream was included in GST. He said, "The remaining 40 per cent should also be included. Bringing products like petrol under GST will help lower the price. "According to sources, Sinha was pressurized by BJP members against visiting the poll-bound state, but he ignored it.